The Animal Liberation Front, and most animal activist groups for that matter, don’t have the best reputation. Thanks to two decades of TV and movies (12 Monkeys, Planet of the Apes reboot, and the first ten minutes of 28 Days Later) animal liberation has, shall we say, somewhat of an image issue. Animal rights activists are often portrayed as scraggly guys with “amateur chess player” beards, unlocking monkeys and thereby infecting an entire populace with a modern plague. But that image is changing. Seeing the clean-cut face of someone like Wesley Omar, leader of the Animal Liberation Front, liberating a single pig from becoming a Chipotle burrito is shocking largely because he looks like a misplaced Jonas Brother. Go ahead and watch it for yourself—imagine an Arcade Fire song behind it—it could easily be an ad for “Gap’s new vegan-friendly khakis” (a non-existent product, but you’re welcome if they come to fruition). 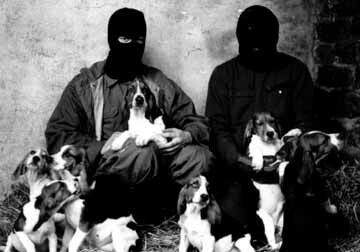 The ALF—or Animal Liberation Front—has been liberating animals since the 1970s and they see themselves as a massively anti-establishment cause dedicated to (as the name suggests) liberating animals. Talking bluntly, they’re often the ones you’d associate with the scraggly-dude profile. They’ve been cited by local and national organizations as being a terrorist group—the two biggest accusers being the Southern Poverty Law Center and the Department of Homeland Security. However, the SPLC had to issue a correction stating that the ALF hadn’t killed a single person. Their message was clear that ALF was a scary organization powered by far-left radicals, with “terrorist-like” methods. 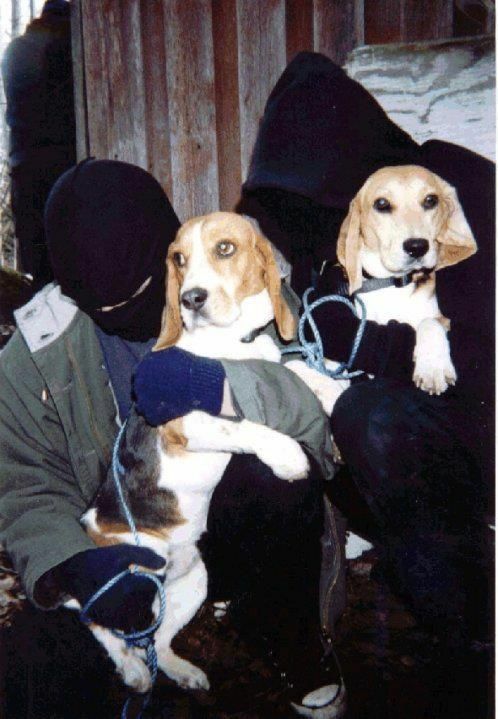 However, with the exception of some acts of arson, the Animal Liberation Front could hardly be classified as a terrorist group. It’s a lot like someone classifying, let’s say, your apartment as an ice cream shop. Sure, at times there’s ice cream in it—sometimes several flavors—but it’s a whole lot of something else before. The Animal Liberation Front itself started as the Band Of Mercy in 1963. 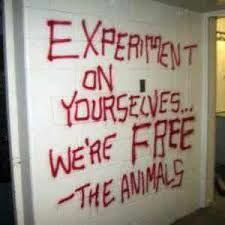 In 1973 they set fire to an animal research laboratory and caused thousands of dollars in damage. They even set fire to the reaiming rubble six days later. Following that, the Band of Mercy changed their name to the Animal Liberation Front and morphed into a multinational cause with both visible and non-visible components. For instance, they have a print magazine, yet no headquarters. A shrewd move, as this above-ground/below-ground technique allows them to be entirely decentralized. The Animal Liberation Front’s magazine (Arkangel) and the sporadic and sometimes shifting—i.e., websites registered in Malaysia—web presence of the Animal Liberation Front itself are about the closest thing the Animal Liberation Front has to a unified core. There’s no gift shop and no bumper stickers like PETA. What’s most interesting, though, is their website, Bite Back. Registered out of Malaysia but with a mailing address to a P.O. Box in West Palm Beach, FL, Bite Back logs dozens of these random acts of “fighting back” in the name of animal welfare. The site claims that over 18,000 animals a year are liberated in the name of Animal Liberation Front / Bite Back, and some 500 acts of arson have been committed in their name. Entries like “Mink Insurrection” and “Sharks Released From Captivity” pepper the long list of entries; some more serious than others. One of the more jarring aspects of the site is the acts of arson and serious property damage combined with the more childish ones, like putting glue in the locks of a fur shop. While disorganization helps the Animal Liberation Front stay out of the spotlight, just a fraction of actual organization within their ranks would go a long way. It’s hard to stand behind a cause when there’s no leader. In any case, Bite Back puts the Wesley Omar incident into perspective: Wesley is just one dude (who happens to have the cheekbones of a Calvin Klein model) amongst a sea of others who are doing the same. Wesley just made his act—quite frankly—more enjoyable than others. He showed his face. He sang Elvis to a pig. It was the kind of well-meaning and otherwise wholesome hijinks that almost any teenager with vegan inclinations could share on their Facebook wall. In stark contrast, though, are the dozens of others who’ve made their contributions more anonymous. Shaky cameraphone video of a dozen chickens running on some grass at night doesn’t exactly push the narrative of animal liberation forward and so the stigma remains. But that doesn’t always have to be the case. 1950’s megastar Doris Day is an animal activist. So is comedian Ricky Gervais. Shock-jock Howard Stern. Actress Charlize Theron. The list is endless. But that shouldn’t surprise anyone: wanting wellbeing for animals is hardly a “radical” stance anymore as the mainstream acceptance of animal welfare grows. Chipotle has a vegan option and most of their selections are vegan-friendly. Dominos Pizza even swings vegan: just hold the cheese and get the thin crust. If you’re at Taco Bell, just order a black-bean burrito “fresco” and, presto, there’s a vegan meal. It’s shocking how vegan-friendly the world can be yet how in-the-shadows the physicality of animal liberation has to be. We’ve reached an odd gap in how we approach animal activism: the image of a scrawny bearded dude opening a cage and screaming “BE FREE!” is still front and center, perhaps because it’s a very easy image to exploit. Imagine, a super left-wing stereotype (i.e. scrawny dude in an ill-fitting loose t-shirt, scruffy beard, possibly a ponytail) opens cages and lets animals out. Terror ensues. The inner Michael Bay in all of us, particularly non-vegans, raises the alarm bells in our heads: the animals shouldn’t be let out! That’s just anarchy! In much the same way that you can easily stereotype the right wing by adding a cowboy hat (or MAGA [Make America Great Again] hat), stereotyping the left as anarchists with ill-thought-out intentions is just as easy for most of the viewing public. There are many movies and TV shows that touch upon animal rights. The subject matter is about animal welfare and liberation, but these are mainstream vehicles. E.T. is a major example, if not about a human animal. And wasn’t the crux of the show Animal Liberation Front about keeping Alf out of the hands of those that wouldn’t understand him? Even the plot of Legally Blonde 2: Red, White & Blonde is about animal testing. But few directly show it—save for hard-edged documentaries showing slaughterhouses and footage from PETA activists on the street. Those images are intended to shock and awe meat-eaters into changing their ways, but perhaps that’s not the way to go about it. Perhaps, instead, there’s a midpoint between the blood-and-guts and the Legally Blonde angle. Perhaps Wesley Omar can be a part of it. The Animal Liberation Front may really just needs a figurehead; a readily identifiable leader who people can look up to. It worked for Martin Luther King Jr, with the American Civil Rights fight. It worked for Cesar Chavez and the National Farm Workers Association. Wesley is by no means in those leagues—he sang Elvis to a freed pig—but it’s a step in the right direction. We reached out to the Animal Liberation Front Press Office to get a statement from them about the contemporary culture of animal liberation activism and their view on Wesley Omar's recent act of heroism. The Animal Liberation Front Press Office is the official information platform of the Animal Liberation Front and is responsible for relaying anonymous communique to the media about the organization's actions. Will Hazlitt is the North American Animal Liberation Press Officer and was kind enough to share a few words on behalf of the organization about the incident as well as what animal liberation entails in today's world in terms of Do's and Don'ts and criminal implications. "We commend and support the actions of Mr. Omar in what appears to be an open rescue of the pig as reported in the media. It is important to differentiate between open rescue, which is what Mr. Omar undertook, and the more clandestine actions of the Animal Liberation Front. Also important to note is that the underground actions of ALF operatives are rarely if ever, punished, in that the ALF operates in total secrecy which makes it exceedingly difficult to determine who the Animal Liberation Front group members are. Any and all actions which result in the liberation of animals from conditions of abject slavery and oppression are to be lauded. And as is almost uniformly the case the liberated animals are provided homes where they can live out their natural lives free from the torment of human beings," Press Officer at the Animal Liberation Press Office Will Hazlitt told us. Wesley Omar is a dedicated Animal Rights Activist. He was brought up on the Isle Of Man and moved to England three years ago. He has been taking part in all forms of activism in the UK since he moved here, liberating animals and inspiring and educating people to make the transition to veganism and getting them to see things from a new perspective. Putting animal rights at the forefront of everything he does. “My journey into veganism all started when I was once depressed and felt I was going nowhere, misunderstanding life, angry and confused whilst flirting with the idea of suicide. I had always wanted to help animals and had always said I would from a young age. The first time I made a connection was when I was 6 years old at Christmas, questioning the Turkey that we had on our table. I had tears down my face when I found out that it was actually once alive. I stated that I wanted to bury him, but unfortunately, I was presented with misleading information and didn’t stop eating meat at that age. The conditioning continued throughout my life of how essential and important it was to eat meat to survive. When I found myself stuck and wanting to end my life when I was 18 years old, thinking of how much I was suffering inside at the time, the thought continued onto animals and I began to understand how much animals are suffering and that they can’t actually speak up for themselves and change their situation. So, after hours of contemplation, I made a promise to myself that day, to devote my life to animals, no matter how upset or miserable I am, I could always be in a position to help them. Still not yet making the connection with ‘meat’ I only had in mind wildlife and domesticated pets. That week, determined to find truths and meanings about life in general, I started to read and educate myself on different religions and spiritual teachings which led on to metaphysics and philosophy. I learned about meditation and how that can have an effect on your brain and overall well being. I had stopped all my prescribed medication that I had been taking for most of my life and decided I’d take up meditation. It was quite difficult at first, but thankfully with an addictive personality I proceeded with it and after three weeks of doing it each day, I felt like I had been born again! I had a new outlook on life, I started to finally enjoy who I was, and I couldn’t believe I’d been misled by doctors, thinking medication was going to cure me, but had only made me worse over the years. This one night I was meditating, a thought came to me… the time when I was 6 years old at the dinner table at Christmas… the turkey I cried for. I began to think of all the other animals I eat… It just didn’t feel right and I saw the hypocrisy of my love for animals and also eating them! That was the first time I realized I was a speciest. All the animals deserve to be treated equally, I thought. The next day the thought stuck with me and with my new philosophical outlook on life, I couldn’t let this go. I had to look into this. I had to see if there was a way I could get by without eating animals. After all, that couldn't be the only place you could get your protein from? I found a bunch of information on vegetarianism and that there was a whole movement around it and there were healthy people adopting it. I couldn’t believe I had continued to consume these dead animals because I was convinced it was essential for my body and I couldn’t live without it, locking it away somewhere in my subconscious for years so I didn’t have to think about the cruelty and murder I was funding. Six months went by. I felt like a new man with a new perspective, feeling healthier than I’d ever been. I spoke to my mum and she said I could come over to England and live with her for awhile if I wanted. I took the opportunity to see what it would be like over there. I continued with my research and it wasn’t long until I stumbled across the dairy & egg industries… I was talking to my younger brother who also had been doing a lot of reading on this. He too felt the same way as me and we came across the vegan movement. When I got to my mums, we watched and read how these industries operate. Both of us were disgusted and ashamed that we were part of it. We agreed we couldn’t be part of it anymore and started to educate ourselves on nutrition as we thought again that if we were to adopt a vegan lifestyle we are going to become weaker and lack in essential nutrients, vitamins, amino acids, and minerals. Well, once again I was wrong! I was pleased to find that plants had everything that we need, so we both went vegan in 2014 on the same day, my mum soon joined us, and she has been the biggest support through everything I have done. Everything I started to find out about veganism, including the benefits to your health, the pollution of the environment, the cruelty and unnecessary murder of these defenseless individuals...it’s like I had been living a lie all my life. As I had made a promise with myself to protect animals, I saw that farm animals were the most oppressed beings on this planet today. I couldn’t allow myself to sit back and let it happen, so I started to tell the people around me how conditioned we really have been! At first, I thought everyone would be interested in listening and wanting to separate themselves from these industries only to receive ignorant remarks from them, people laughing and making jokes in front of me because I didn’t want to be part of any murder or violence, especially towards the most vulnerable and innocent beings on this planet. I was confused, trying to explain that we don’t have to contribute to murder to live a healthy life. It was harder than I imagined since people have been indoctrinated and brainwashed a lot heavier than I thought. Not knowing how to respond in the best way that would be influential to them, my responses came from anger rather than love. This showed through and my arguments presented to them weren’t great, but I learned over time to find a logical answer to their excuses and when it comes down to it, there are only two reasons people do it: taste and profit. Neither one is more valuable than life. Every time I’d see the dissembled body parts on the shelves in the shops and the breast milk that was stolen from enslaved mothers, I’d be infuriated seeing this, whilst they falsely advertise their neatly packaged flesh or milk with pictures of happy animals and loving farms with enticing quotes on top of the aisles. I felt I had to do something for these slaves, I felt I had to change this injustice. Everyone is so dissociated from the meat they have on their plate to actually once being a living being that had to suffer and be murdered for a few minutes of taste in their mouth, something of which they can acquire the exact same taste and textures from healthier plant-based products. I started to watch YouTube channels of people speaking to the public, going to vigils and doing other various activism work with people on the streets. As I watched the reactions from the public and as I read the comments on the videos, I was amazed to see how much of a positive impact they were having for the vegan movement. This is such a vital piece of work I thought. The only way we are going to achieve our long-term goal of total animal freedom is if the world becomes vegan. I began to start going to protests and do outreach work with the public as I felt it was a necessity to do so. I didn’t enjoy social media at all. I would prefer we didn’t have to use it, but it is undeniably useful for getting a message across to the world, and I believe without it, there wouldn’t be as many vegans as there are today. When I came to realize this, I thought I’d start using it as a platform to see if I can contribute to getting our message across. As always, I feel like I’m never doing enough. I’m looking for new ways to make improvements and do more for animals. The latest liberation I did was in a concentration camp that enslaved a couple of thousand pigs. I made a decision that I wanted to film and expose the conditions of the pigs and show people exactly what they are doing to these innocent beings in hopes that people would make a connection. I thought of different ways I could make the video have the best impact on the viewers, as they aren’t willingly going to go and look for this sort of footage themselves. I decided to do an ‘open rescue’, something that is happening more often around the world from the likes of DxE (Direct Action Everywhere). I wanted to tell a story, I wanted people to watch it and not for them to just ignore another video of animal abuse, as we only get shown a glimpse of the violence and learn nothing more about the individuals and it’s getting people to realize that is exactly what they are, individuals. Whenever I had tried to show a video to my family and friends of the inside of farms and slaughterhouses, most of the time they would not watch it. They don’t want to, as they feel bad and guilty for the animals but they willfully ignore what I show them. The same for the majority of carnists. I thought if I present myself it will have more of a personal connection with them, which has since proven to be the case with how much of a positive impact it has had. As I write this, I’m currently under investigation by the police and have been released on bail. I was fully aware that this could possibly happen before uploading the video. I knew the consequences and decided that the lives of these slaves are more important than me and my own security. The message is so important, it comes before me. I decided to upload it. The video involves myself going into a pig farm and filming the conditions of the pigs, who were covered in their own feces, with scratches across their bodies, and such little room to move around in that some were laying on top of each other. They had nothing to play or forage in, they had wooden slates beneath them for their excrement to fall through, and these individuals would have never have seen the light of day before. There were just corridors of these harmless individuals crammed into confined spaces. It was like walking through something of a horror film. It always is and I’ve seen a lot worse. It truly breaks my heart and feels somewhat surreal when you’re there, looking each animal in the eyes. After rescuing the pig. We both left and drove to his new home, where he is now safe and secure, with lots of stuff he can play with and plenty of room he can roam around in. He now gets to breathe the fresh air, feel what it’s like to have the sun over his head and what it’s like to run with the earth beneath him, and his story will continue to inspire others. I’m sick and fed up with acts of evil such as murder of such innocent and defenseless individuals being protected by law, only for someone to make a profit off their backs and others that will eat their decomposing flesh only to increase their risk of ill health. If I was to stab a dog and eat him in this country I’d be locked up. Seems like a double standard and hypocrisy to me. It reminds me of when black people were enslaved, which was well within the law and if no one had challenged the law then, it’d still be considered okay to do this. Only because the black man looked different to the white. How sickening is this? We all look back ashamed that humanity would allow such horror to happen and be protected by the law, along with all the other events that oppressed minorities, all because we looked at our differences rather than our similarities. We may look different to one another but the key thing that all sentient beings possess is the desire to live and the ability to suffer, two of which should be respected and all should have the right to live a life free from suffering and murder. We are a species of evolution that possesses empathy and we shouldn’t ignore this, as it is an attribute we can utilize so we can work towards a truly peaceful world, and this is our next step in evolution. People seem to judge animals on their own ability to understand them, but that says more about the person than it does about the animal. I now want to be open with what I do. I want to get our message across to the world. I’ve had hundreds of inspiring messages and dozens of carnists now questioning what they’re doing and asking for more information on veganism. A lot of them are already trying it out, including one girl that works on a farm and is trying to now find a different line of work! Vegans have stated to me that it’s inspired them to get more active. All from this one video, it’s had more of an impact than all the street activism I have done collectively. The story hit the national papers, unfortunately not explaining the motive of the video, but still, it got people talking, it got people clicking onto the video. here are different opinions that people have on the video but you can’t please everyone and it’s about the slaves, not them. But thankfully most of the views people have on it are positive! The day it was published in the national newspapers, someone had sent me a message from the Isle Of Man with a picture of the article in the paper, I was shocked as no one from the papers had spoken to me! I got a call from work that day, they stated that unfortunately, I’m going to have to be put on suspension whilst they investigate the matter further, as the papers had put in their article where I worked. The charity I worked for said they were getting numerous calls from the press asking about the situation. Whilst I was suspended from work, I saw it as a positive and an opportunity to get out on the streets and do some more street activism. I got a call from work later on in the week saying they want to have a meeting with me. As I was getting prepared and ready for my meeting with work, my step-dad came up the stairs to tell me that the police were there. As I walked down the stairs, I was confronted by three police officers in our hallway. One stated they were here to do an investigation and search the house. They wanted to know where my mobile phone was and where the pig was being kept. If I didn’t give these two things up, I would be arrested and took into custody. As I questioned the police officers, one said: “We just want to see how the pig is and get him checked out by the vet”. In other words, they wanted to take the pig back and send him to slaughter. I wasn’t going to be fooled as I’ve dealt with the police before and unfortunately I have learned the hard way that they don’t always stick to their word. I have nothing against the individual officers personally. They probably are great people who have also been indoctrinated and brainwashed themselves without even questioning anything they are told to do even if it goes against their own morals. So, as I didn’t give them anything, they arrested me and searched my house only to find nothing. They took me into custody for questioning and I spent the whole day in the cell and have now been released on bail whilst they investigate it further. I spoke to my work the next day. I went in and had a meeting and the following week I met up with my manager. I was told to hand over my uniform and other materials as I will no longer work for them. I believe they fear the media attention and how it would reflect on them as they work closely with the government and don’t want to hold any biased views. I am still very happy with everything because I have achieved more than I thought with the video, even though I have lost my job and I’m currently on police radar. The amount of people that have been inspired by the video is well worth my personal losses as the world has gained more positives from it. The lives of these slaves will be considered by more people and more will have their lives spared by new people adapting to the most ethical way to live: as a vegan. Animal liberation is a necessity to give the individuals their birthright back, but without people knowing about their stories, these individuals will continue to be bred into existence and will not have an effect on the masses of animals that are going to go through the exact same thing. If we are aiming for total animal slavery abolition, we need the whole world to be vegan and for that to happen, people have to make the connection somehow. With each day passing by, my dedication to the cause keeps growing and I now see animal education and liberation as my obligation. Everything that I do is for the innocent and vulnerable and all I’m doing now is using myself to project their screams and cries into plain English for people to understand and that is all I am: a voice for them. There are a lot of risks involved when you do this sort of thing and everyone’s circumstances are different so everything has to be taken into consideration and planned correctly, but there are endless types and forms of activism that you can do to inspire people and help the oppressed. I always think of their suffering and their desire to live. This fuels me each day to go out and do something. You should always research and plan ahead for the benefit of everyone. I will continue to use all forms of activism that are most effective both open and anonymous.